The great rival advertising shows to "boom up" stocks / Gillam. Print shows three "advertising" sideshows, on the left, the "Great Northern Pacific R.R. Show Patronized by the European Aristocracy" with Henry Villard as the barker and Carl Schurz playing a drum; includes portraits hanging on the side of the tent showing a "Famous German Painter engaged at a cost of $15,000!!! ", a "Celebrated German Author, A Live German Baron! !, British Interests Member of Parliament, A Genuine English Lord, the real article, Bavarian General, [and] English Aristocrat". On the right is the "Great Yellowstone Park Show" with "Uncle Rufus Hatch" as barker and Charles A. Dana playing the trombone; includes portraits hanging on the side of the tent showing a "Scout, Arthur's Cabinet [Robert Todd Lincoln], Little "Phil" Sheridan, Great American General, [and] President Arthur" fishing. At center, in the background, is the "Western Union Show" with Jay Gould sitting in front of a tent labeled "Happy Family Inside". Between the sideshows are several well-dressed, serious-minded men, one labeled "Investor", considering the merits of each show before investing. British and American political cartoons from 18th century. Congressional contempt / F. Opper. The moths and the candle / F. Graetz. Puck's coaching parade, 1883 / F. Opper. Passing everything on the road / J. Keppler. The two dromios / Gillam. Map of the country from Lake Superior to the Pacific Ocean. From the latest explorations and surveys to accompany the report of the New York Chamber of Commerce, April 1868. 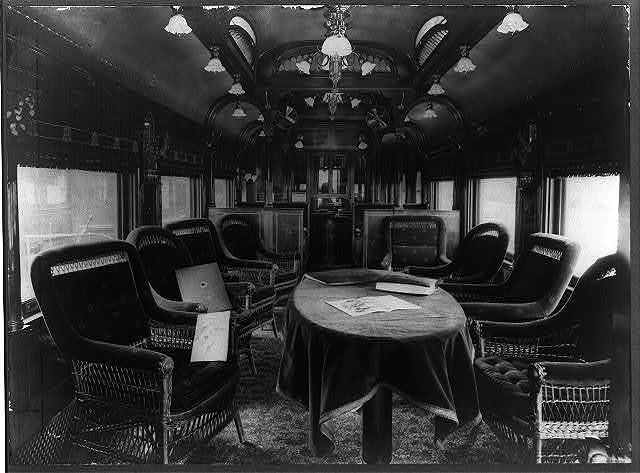 Observation car interior, N. P. Ry. Preliminary sketch of the Northern Pacific Rail Road exploration and survey, by I. I. Stevens, Governor of Washington Territory. Map of the country tributary to the Northern Pacific Railroad, compiled from English, Canadian, and American official sources and original surveys by Edward H. Knight, Jan. 1st 1871.